Leopard sharks are a small species native only to the Pacific coast of the United States and Mexico. Most individuals only grow to about four or five feet long. 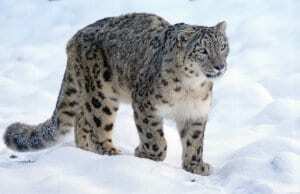 Their name comes from the large spots the cross their back and sides. These coastal sharks are most common in extremely shallow water, usually less than 13 ft. deep. 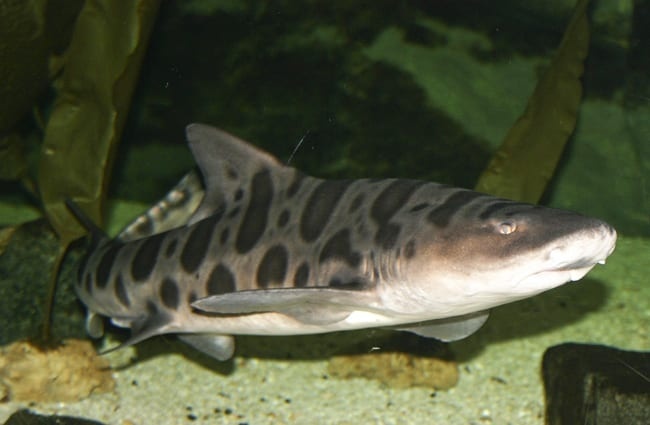 Read on to learn about the leopard shark. This species of shark is long and somewhat stout-bodied. They have short, round snouts, with flaps of skin near their nostrils. These sharks have two large dorsal fins along their backs, one slightly after their pectoral fins, and one near the start of their tail fins. Along their backs and sides they have dark spots and saddle-like blotches. As with many shark species, this coloration is much more drastic in young animals, and becomes less so in older individuals. 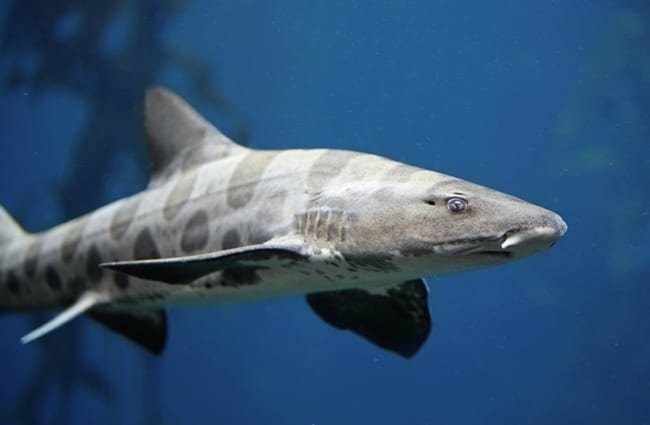 Unlike some species, like tiger sharks, adult leopard sharks still have drastically distinguishable markings. These relatively small sharks are actually quite interesting creatures. 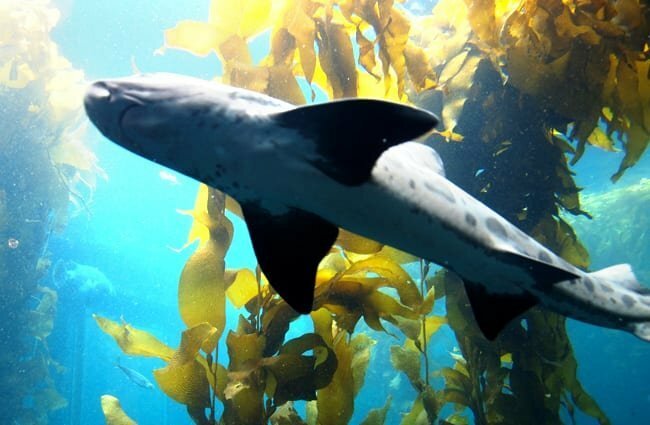 Cruising through the Pacific kelp forests, packs of leopard sharks are surprisingly adept hunters. Learn more about them below. Social Sharks – Just like nurse sharks, blue sharks, and lemon sharks, this species is one of the handful of shark species that is surprisingly social. 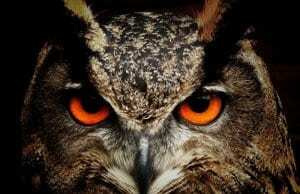 They will congregate in groups of similar age or gender, and search for food together. Cooperative Feeding – These sharks aren’t only social with each other, they are also known to interact and cooperate with other shark species. Scientists have seen groups of leopard sharks, dogfish, and smooth hounds sweep together through an area to flush out food. Daring Dinners – In their search for food, this species will enter some pretty perilous areas. They follow the incoming tide onto mudflats and into tide pools to feed on the animals hidden within. This behavior gives them access to some animals that might usually be impossible to eat. Specialists – Depending on where the sharks live, they will prefer a specific type of prey, especially if that prey is very abundant. For example, the population in Tomales Bay spends the vast majority of its time hunting innkeeper worms and crabs. These invertebrates are easy prey in the bay, and provide the sharks with a plentiful food source. These predators have surprisingly specific habitat preferences. They restrict themselves to extremely shallow areas, and just a handful of habitats. Most leopard sharks reside within enclosed bays or estuaries, particularly those with muddy or sandy bottoms. They also frequent kelp forests, intertidal zones, and rocky reef habitats. This species of shark has a very restricted range. They reside only along the Pacific Coast of the United States and into Mexico. 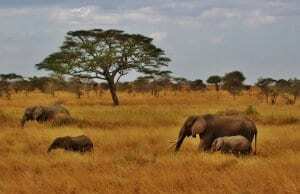 Within this range, individuals do not travel excessively far, so there are a number of distinct populations. The northernmost reach of their range is Coos Bay in Oregon, and the southernmost is Mazatlan, Mexico. This species does not live anywhere else in the world. 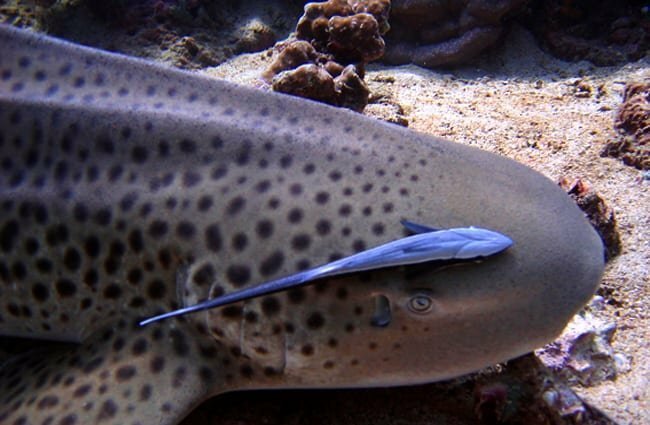 Though much smaller than the nurse shark, the leopard shark is similar in its feeding methods. Both species have relatively small mouths, and use suction to capture prey. Leopard sharks feed on bottom dwelling organisms, and just about anything small enough to fit in their mouths. 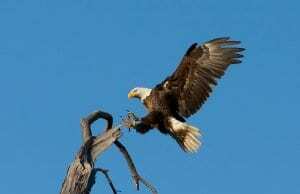 Their primary prey sources include crabs, small fish, clams, and worms. Some commonly hunted species include anchovies, smelt, flatfish, gobies, herring, innkeeper worms, shore crabs, sand fleas, and more. As shallow water species, this shark is pretty commonly sighted. They are quite shy creatures, and generally flee as soon as humans approach. 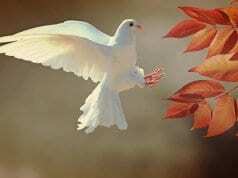 The only known record of aggression towards humans was a single incident in 1955. Even during this incident, no injuries ever occurred, and scientists determined that the cause was likely the diver’s nosebleed. Sadly, these sharks do face some danger because of humans. Fishermen catch them, both recreationally and commercially for their meat and fins. In addition to purposeful hunting, they also accidentally trap these sharks in nets and lines set for catching other species. Despite these dangers, the IUCN lists these sharks as Least Concern. Humans have not domesticated leopard sharks in any way. 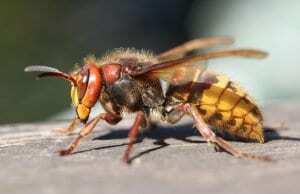 This species thrives in human care, but they are not good pets. Even though they grow to a maximum length of five feet, that still requires a significantly sized aquarium. 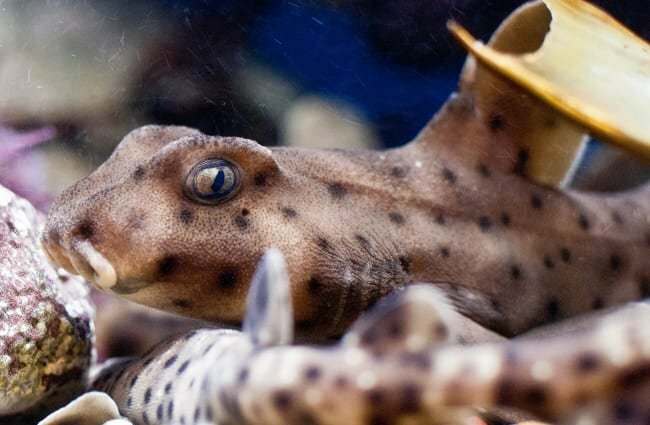 Unless you have extensive resources for care and maintenance, the leopard shark is probably not the right choice for your home aquarium. This shark species does well in aquariums and zoos. They are especially fond of kelp forest habitats, and rocky reef structures. Far from picky eaters, they will eat a variety of fish, squid, and crustaceans while in human care. 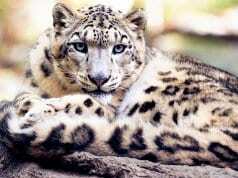 Because of this, a number of zoos and aquariums are successful in housing this species. They can live over 20 yrs. with proper care. Another trait that this species shares with nurse sharks is its ability to rest on the sea floor. They are capable of pumping water through their gills, a trait many species are unable to do. 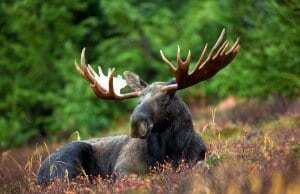 Most rest on the bottom, or hide in rocky crevices, during the daytime. At nighttime they emerge to hunt for prey, frequently in large groups. Foraging behavior varies greatly by region and population. This shark species is ovoviviparous, which means that they develop their eggs inside of their body before giving “live birth.” Many populations use protected bays and estuaries to give birth and reproduce. These protected areas become nurseries for the young sharks until they are large enough to defend themselves from predators. Female leopard sharks can produce anywhere from a single pup to 37 pups per litter. The larger the female, the more pups she can develop.